Luc Besson directed The Professional, The Fifth Element, and more, so I have no idea why it's taken this long to get his newest film, The Extraordinary Adventures of Adele Blanc-Sec, released in the U.S. but here’s the other offerings accompanying mademoiselle! What if Indiana Jones was a Victorian-era Frenchwoman? Well, then he’d be Adele Blanc-sec, the heroine of Luc Besson’s new movie. The DVD cover has her riding a pterodactyl, for goodness’ sake – what more do you want? When the curse of Storybrooke is broken, its fairy tale inhabitants must deal with the return of their lost memories as well as the return of magic. Can someone call me when Tron finally shows up? The Second Doctor and UNIT deal with mysteriously dead miners whose corpses glow green, a.k.a. “The one with the maggots.” The special edition includes the regular ton of extras including commentaries, a making-of featurette, a bunch of interviews, and a Sarah Jane Adventures two-parter with Matt Smith. William Shatner discusses Star Trek (and himself) with the four other original universe Captains in these extended interviews that made up the Captains documentary. If you like to hear about people talking about William Shatner as much as William Shatner does, you are in for a treat. The original Muppet movie comes to Blu-ray with never-before-seen footage, an interactive intermission, Frog-e-oke, and more. Now we need The Great Muppet Caper to hit Blu-ray, because if anything Muppets deserves to be seen in HD it’s Charles Grodin’s wooing of Miss Piggy. 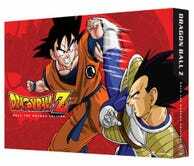 Original fans of Dragonball Z — the ones that watched Cartoon Network put the same 53 episodes on over and over and over again in the late ‘90s — may be thrilled at this box set which contains the original U.S. TV broadcasts, complete with the original dubs, on DVD for the first time in a decade. To everyone else, it’s somehow yet another different DBZ DVD release. Imagine The X-Files and The Twilight Zone with giant monsters — that’s Ultra-Q, the classic Japanese TV series that inspired Ultraman. Someone tries to harness energy from the sun and fucks it up, dooming us all, and somehow it's up to Matthew Modine to find a way to save us. A South Korean woman remembers a time when she was young and befriended a werewolf, which goes better than you’d expect but by no means goes well. Felicia Day and assorted misfits have the often boring but occasionally high-stress job of protecting the Earth from incoming asteroids in this scifi office comedy. Tony Robinson — best known as Baldrick on the Blackadder series — leads a team around the world to search for the mysteries of the past in this British science/reality show. If I’m going to be taken on an archaeological adventure, something tells me I’d prefer it to be led by Adele Blanc-Sec instead of Baldrick.